The main raw materials for AlNiCo magnets are iron, aluminum (~9%), nickel (~13%) and cobalt (~24%). In addition, various other elements are added. Two different production techniques are used: the pouring technique and the sintering technique.They are also available as plastic-bound magnets. The finished magnet is very hard and can be further processed only by using diamond tools or the erosion process. 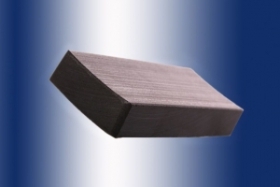 AlNiCo magnets are characterised by a high corrosion resistance. They have an extremely low (negative) temperature coefficient and can be used at temperatures ranging from -250 to +500°C. Depending on the alloy, the remanence of AlNiCo magnets lies between approximately 0.70 - 1.2 Tesla. The coercive field strength of 50 - 150 kA/m is approximately 10 times smaller than of NdFeB magnets.